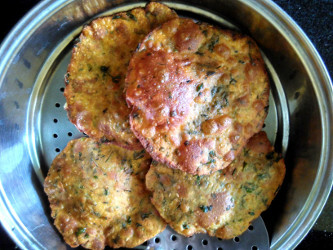 Fenugreek leaves poori methi puri recipe with step by step instructions and pictures. 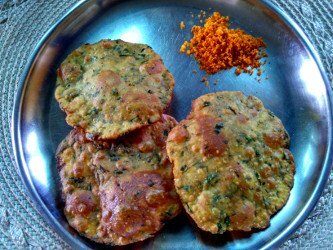 Methi puri can be eaten at breakfast, snack, lunch or dinner. If you do not have fresh leaves, you may use the dried methi leaves, kasuri methi, instead of fresh methi / fenugreek leaves. Methi leaves are easily available during winter. Methi / fenugreek leaves have a peculiar, slightly bitter taste and flavor which makes the poori very tasty. 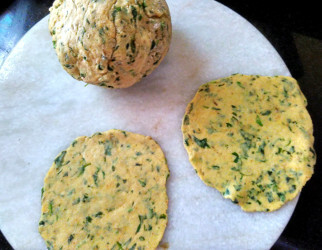 You may make the methi puri dough ready and keep it in the fridge for 3-4 days and make poories whenever you want them. Salt -1/2 tsp or according to taste. Seperate methi leaves from stem. We are going to use only methi leaves and not the stems. Instructions for washing leafy vegetables are at the bottom of this page. Wash methi leaves according to the instructions given below. 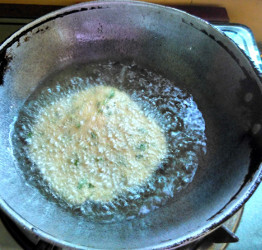 Add a little oil to a frying pan and heat it. Add the chopped methi leaves to the hot oil and stir fry for 2-3 minutes till they wilt. Remove pan from flame and keep aside to cool to room temperature. When methi is cooled to room temperature, add the wheat flour and other ingredients. Add water a little at a time and form into a thick dough ball. Keep dough aside for 15-20 minutes if you have time. Otherwise you may make the poori immediately. Heat oil in a deep pan or kadai. Once the oil is hot, keep the heat medium. Divide the dough in small lime sized balls. Roll each ball into a circle as shown in the image below. Add carefully each rolled circle into the hot oil. Press lightly with a slotted spoon so that the poori puffs up. Cook for a few seconds till the bottom is golden brown and then turn the poori and cook the other side till it is golden brown. 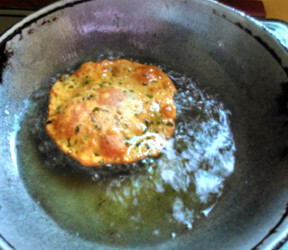 You can see in the image below, one side is cooked, the poori is turned and is now cooking on the other side. Using the slotted spoon, take out carefully the poori and place it on a colander to drain well. 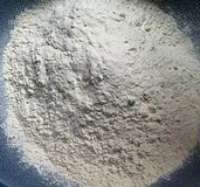 You may use dried methi / fenugreek leaves if fresh methi is not available. If using dried leaves, soak them in hot water for 10 minutes. Then add all the other ingredients and make the dough. There is no need to cook dried methi leaves. We all wash vegetables before using them in a dish, raw or cooking. We wash most vegetables by holding them under running water, such as tomatoes, eggplants, cucumbers, gourds etc. But where leafy green vegetables are concerned, it is not enough to hold the leafy vegetable under running water to clean. As these leafy vegetables grow closer to the ground, and because of their soft, leafy structure, they collect a lot of dirt,mud, soil etc. So we need a special technique to wash them. It is better to wash vegetables before chopping to retain the vitamins/nutrition in them. Add the methi / fenugreek leaves to a bowl of water. Stir with a spoon or you hand. Any sand, dirt etc. will settle at the bottom of the bowl. The leaves will float on the surface. Remove the leaves and add into a fresh bowl of water. Do this 2-3 times till there is no dirt/ sand at the bottom of the bowl. Place the leaves on a colander/sieve and wash under running water. Keep aside to drain for 10-15 minutes. Now you may use your leafy vegetables in your desired recipe. Aloo Bonda - Batata vada- Chickpea flour and potato snack.